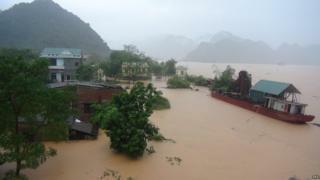 Severe flooding in central Vietnam has left at least 21 people dead and submerged tens of thousands of homes. Worst affected is the province of Quang Binh, where at least 11 people have been killed, crops destroyed and livestock washed away. The floods have been caused by torrential rain, but local media say sudden discharges from hydropower reservoirs worsened the flooding. Typhoon Sarika could bring more bad weather if it strikes Vietnam. "We are worried", disaster official Tran Le Dang Hung told news outlet AP. "We have instructed district governments to outlet plans for evacuating people." On Sunday the storm hit the Philippines, leaving at least two dead and displacing more than 150,000. Several thousand people had evacuated there ahead of the typhoon, and property damage, downed power lines and fallen trees were reported. Typhoon Sarika could hit northern Vietnam early next week, according to the country's weather bureau. So far the flooding has affected tens of thousands of people across four central provinces. Images show houses with only their roofs above water. Local media say more than 70,000 houses have flood damage in Quang Binh and almost 25,000 in Ha Tinh province. Rice fields and other agricultural land have been inundated, local media report, and the main north-south rail link is affected. In Quang Binh, questions were being asked over the release of water by hydropower plants. VnExpress quoted a provincial official as saying that discharges had caused water levels to rise fast. "The dam operators should have informed locals properly in advance," he was quoted as saying.